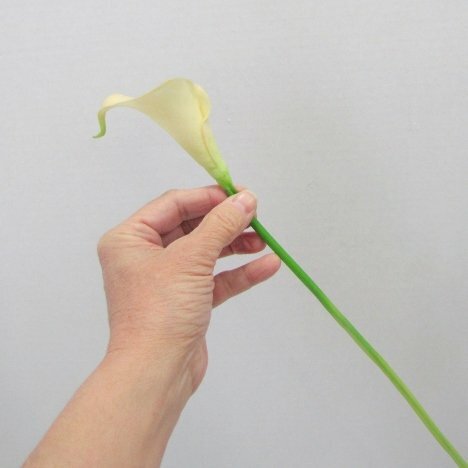 I usually make a calla boutonniere from miniature blooms. 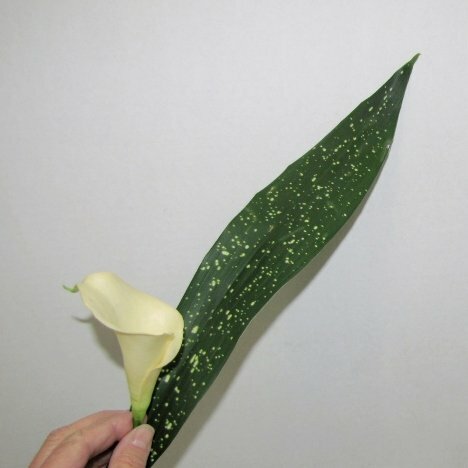 As you can see by the photo below, there is a significant difference between both the head and stems of a miniature calla when compared to a standard calla lily. 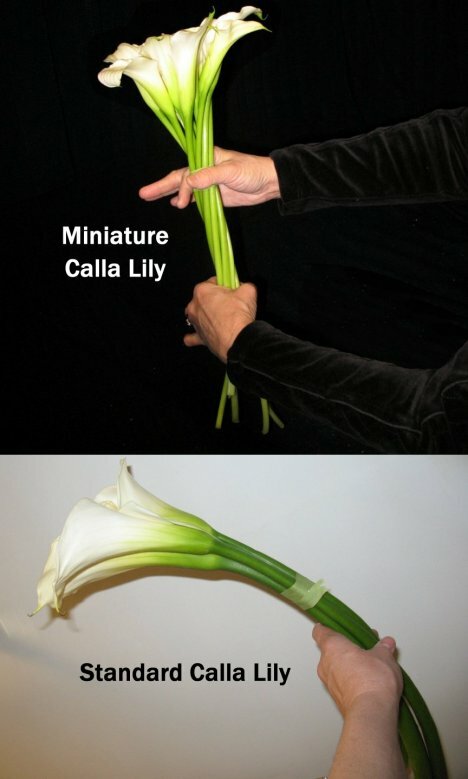 Callas are packed ten blooms to a grower's bunch and usually come wrapped in protective cellophane. 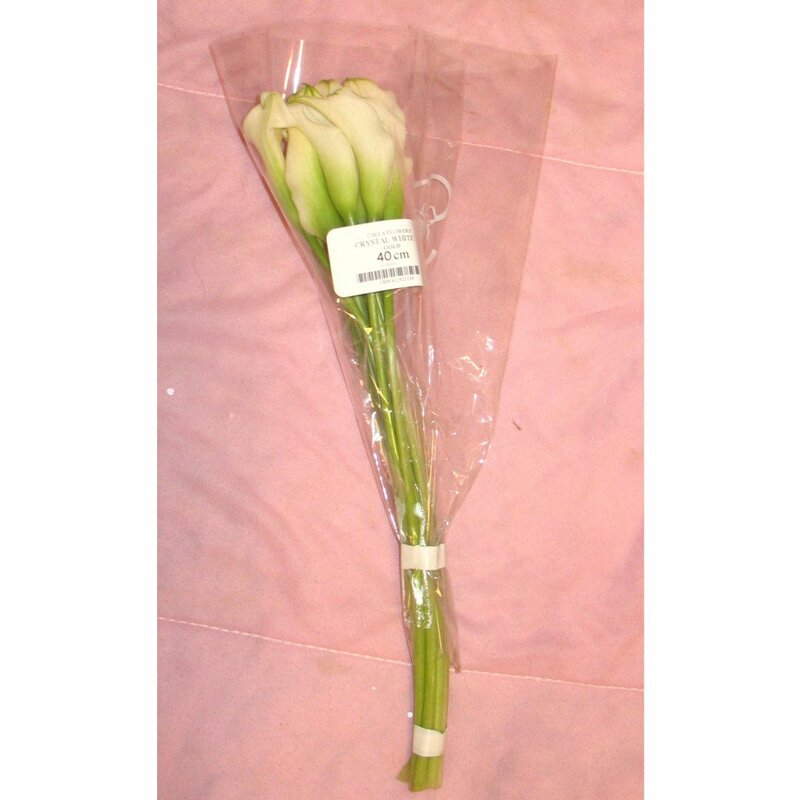 Be very careful when unpacking not to damage or cut any of the flower stems or heads with your knife. 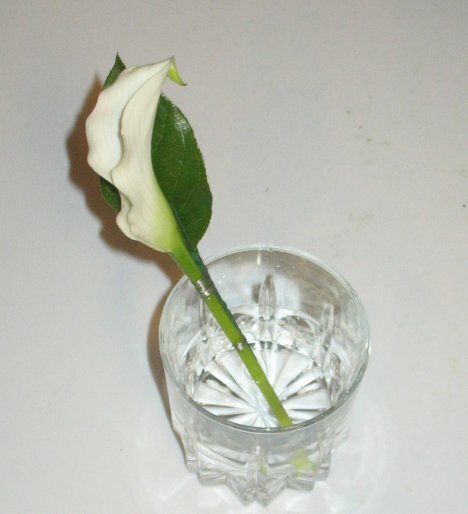 Keep your callas in a narrow glass to discourage bending and with only an inch or so of water. Too much standing in a full glass of water can soften the stems and introduce bacteria, causing early rotting. You may have to gently roll your stems in paper before standing in their water (don't let the paper get wet.) This helps straighten very bent stems. 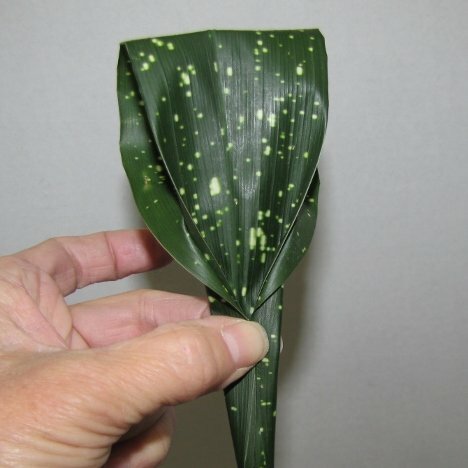 The only greenery we are going to use in this boutonniere tutorial is a sleek variegated aspidistra leaf. 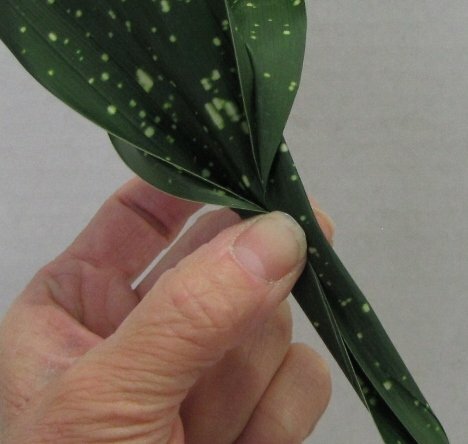 Fold the leaf over until the tip is just below where the stem starts. 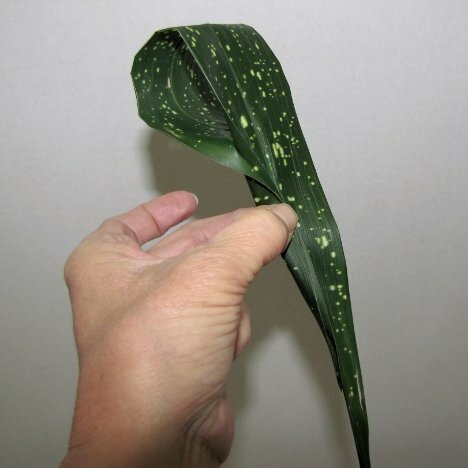 Fold over the left side of the leaf edges towards the middle. Now fold over the both edges on the right side until they meet the left folded edges in the center. 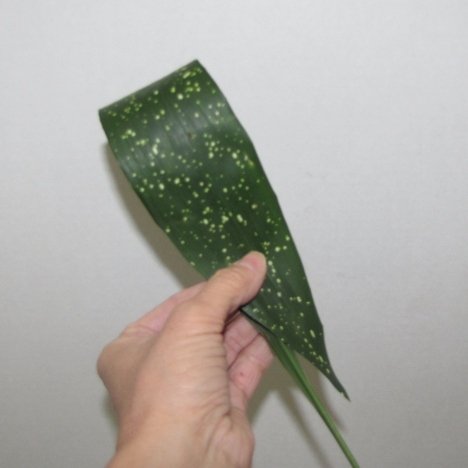 Keep your finger and thumb tightly clamped on the pinched apsidistra leaf edges, keeping them in place so you can wire them. Make sure you like the look before wrapping, since the fine wire will actually cut into the leaf when you wrap it. There will be no undoing it and rewrapping. 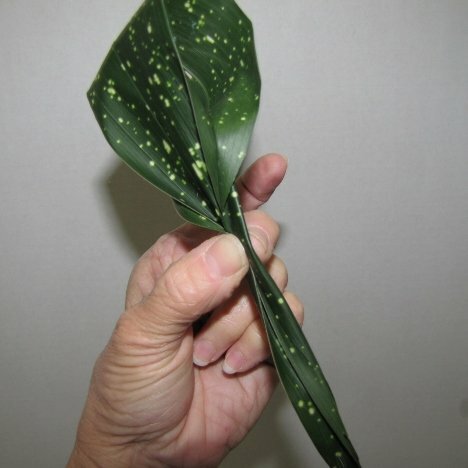 The folded leaf should have a concave in the center where the calla lily will nestle the head inside.